Two-Part Epoxy Adhesives | Loxeal S.r.l. Recommended for structural bonding of many materials: metals, ferrite, ceramic, marble, glass, concrete, wood and some plastics (polyester, ABS, rigid PVC). Not indicated for rubber, soft materials, polyethylene, polypropylene and PTFE. Bondings are well resistant to water, gasoline and oils. Multipurpose, transparent structural adhesive, fast setting time. Recommended for structural bonding of many materials : metals, ferrite, ceramic, marble, glass, concrete, wood and some plastics (polyester, ABS, rigid PVC). Not suitable for soft materials, polyethylene, polypropylene and PTFE. Multipurpose transparent structural adhesive, fast setting time. Not suitable for rubber, soft materials, polyethylene, polypropylene and PTFE. Bondings are well resistant to water, gasoline and oils. Multipurpose, thixotropic transparent and flexible structural adhesive, fast setting time. It is designed to be non-sagging for ease of use on vertical surfaces. Recommended for structural bonding of many materials: metals, ferrite, ceramic, marble, glass, concrete, wood and some plastics (polyester, ABS, rigid PVC). Not suitable for soft materials, polyethylene, polypropylene and PTFE. resistance to water, gasoline and oils. Highly flexible structural adhesive with improved peeling adhesion and shock resistance. Recommended for bonding of many materials : metals, ferrite, ceramic, marble, glass, concrete, wood and some plastics (polyester, ABS, polycarbonate). Not suitable for PE, PTFE and silicon. Bondings are well resistant to water, gasoline and oils. Multipurpose, transparent colourless structural adhesive. It provides a flexible film with good adhesion and peeling strength on metal substrates. It is recommended for structural bonding of many materials: metals, ferrite, ceramic, marble, glass, concrete, wood and some plastics (polyester, ABS, rigid PVC). Not suitable for soft materials, PE, PP and PTFE. Bondings are well resistant to water, gasoline and oils. Not indicated for rubber, soft materials, PE, PP and PTFE. Bondings are well resistant to water, gasoline and oils. Thixotropic two-components adhesive based on epoxy resin, which cures at cold or sparing temperatures. It’s specific for bonding of metals, ceramics, woods, foamed materials, many plastics and composites. It provides strong adhesion and high resistance to impact, shocks and vibration. It allows large-size pieces positioning. Loxeal 4401 is a toughened, semi-flexible, high-temperature resistant, two-part epoxy resin, which provides good adhesion on a variety of substrates as wood, metal, ceramics and many types of plastics and composites. Mixing ratio 2:1 by volume. It provides a strong adhesion with high peel, cut and shear strength up to +120°C temperature with peaks at +140°C. Excellent resistance at high temperature for short periods, as i.e. in stove enamelling cycles. Loxeal 4428 is a thixotropic, two-components epoxy resin. Especially developed for composites bonding, it provides excellent impact and vibration as well as high temperature resistance. It’s ease of mixing and applications allows its use on gap filling. Loxeal 4429 is a toughened, semi-flexible, high-temperature resistant two-component epoxy resin. Especially developed for composites bonding, it provides good adhesion on various substrates as wood, metal, ceramics and many types of plastics. Designed to be nonsag for ease of use on vertical surfaces and in wide gaps. Mixing ratio 2:1 by volume. It provides a strong adhesion with high peel, cut and shear strength up to +120°C temperature with peaks at +140°C. This Two Components Adhesives are based on a modified epoxy resin. They’re designed for applications that require flexible bonding and sealing. They can resist to high temperature, be self-extinguishing and thermally conductive. 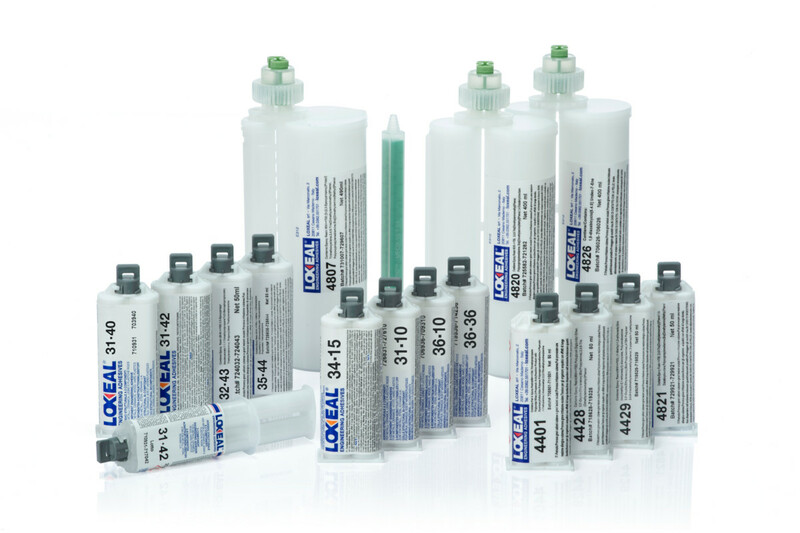 Loxeal 4807 is a two-components adhesive based on modified epoxy resin for flexible bonding and sealing applications. It fully adheres to plastics like PA, ABS, PC, PET, PMMA, PI, metals ceramics and composites. After full curing the adhesive looks soft and flexible. It provides high temperature resistance up to +120° with peaks to +150°C. Suitable for bonding and sealing glass fiber, metal frames in white appliances production (dishwashers, washing machine), and in automotive (lighting). Self-levelling two-part adhesive based on modified epoxy resin for flexible bonding and sealing applications. It fully adheres to plastics like PA, ABS, PC, PET, PMMA, PI, metals, ceramics and composites. Temperature resistance up to +120°C with peaks to +150°C. Two-part adhesive based on modified epoxy resin for flexible bonding and sealing applications. It fully adheres to plastics like PA, ABS, PC, PET, PMMA, PI, metals, ceramics and composites. Initial fast setting. After full curing the adhesive looks tough and flexible and provides high peel resistance. Temperature resistance up to +120°C with peaks to +150°C. Specifically designed when self-extinguishing and thermal conductivity properties are required, it fully adheres to plastics like PA, ABS, PC, PET, PMMA, PI, metals, ceramics and composites. After full curing the adhesive looks tough and flexible and provides high peeling strength and temperature resistance up to +120°C with peaks to +150°C.